The largest percentage of Americans ever say the terrorists have the upper hand in the war on terror. Additionally, three-in-four Americans say they’re unhappy with the way the war on terror is going. The poll also showed a 14 percent spike in those who said they had zero confidence in the Obama administration’s handling of terror. 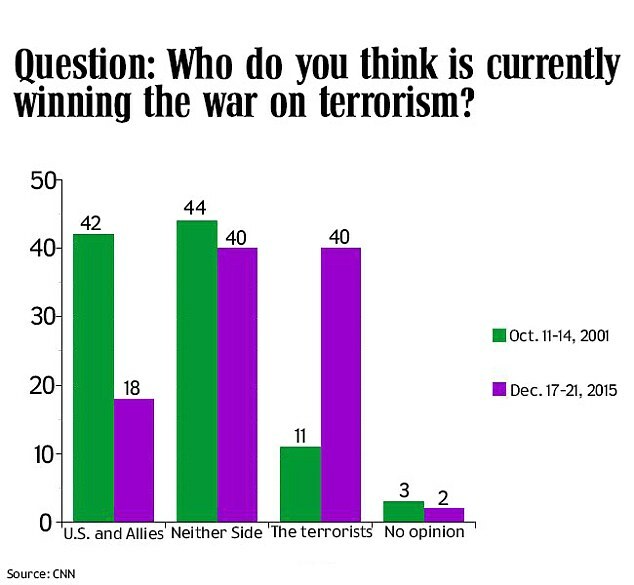 Americans believe more than ever that the terrorists are winning the war on terror. In a new CNN/ORC poll, just 18 percent of Americans surveyed said the U.S. and its allies were ahead in the terror fight, with 40 percent now saying the terrorists have the upper hand. The numbers are almost completely flopped from when the question was first asked, just one month after the 9/11 terror attacks. Then, 42 percent said the U.S. was winning the war on terror, while 11 percent said the terrorists were dominating the fight. Those numbers have bobbed up and down through the years, but this latest poll showed the most dramatic spike in public opinion, as Americans have grown increasingly concerned about ISIS in light of the attacks in San Bernardino, California and Paris, France. Reinforcing that point, 74 percent of survey respondents said they were not too satisfied or not satisfied at all with the way things were going for the U.S. in the ongoing war on terror. The last high water mark for that question was 61 percent, which was recorded in August of 2007, according to CNN. When the question was last asked to the American public, in August 2008, just months before President Obama was elected, the largest group of respondents said they were somewhat satisfied with how the war on terror was going. Now the largest chunk of Americans says they’re not at all satisfied with the way things are going as the country deals with this threat. The survey was conducted between Dec. 17-21, several weeks after an ISIS-aligned couple slaughtered 14 people at a holiday party in California. The margin of error for the entire survey is plus or minus 3 percent. These poll numbers aren’t a positive for President Obama as his administration’s credibility on the issue has declined. For example, 64 percent said they disapproved of Obama’s handling of ISIS, a number which has remained constant for the past six months. Additionally, 50 percent of Americans say they have no confidence or not much confidence in the Obama administration’s ability to protect citizens from the terror threat. Breaking down those numbers, 20 percent said not much, which was similar to the 19 percent who gave that response the last time the question was asked, in January 2010, a year into the current president’s administration. The spike comes from those who say they have zero confidence in the current White House, with 30 percent now giving that response, up from the 16 percent who said it in 2010. While more than half of Americans (53 percent) said they believed the United States government could prevent future terrorist attacks, up from 32 percent who gave that answer in April 2013, the American public is split on whether ground troops should go into Syria and Iraq to rid the world of ISIS. In the new survey, 49 percent were in support of sending troops, while 49 percent said they were against such an action. Support for boots on the ground has gained some steam in the past 15 months, hopping up 11 points since 38 percent said they’d like to see troops engage with ISIS in Sept. 2014.